Beautiful sun here this morning. Not warm but at least sunny. Put the mares out and hooked the barnyard gate. 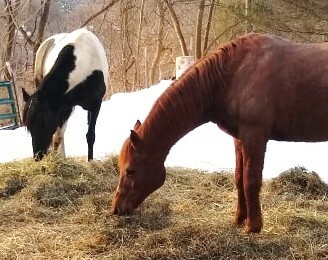 There is water in the pasture and I put a bale of hay out there for them. Yesterday Whisper reverted to her old pace in front of the barn ways and made a muddy mess. I really need to get a couple of loads of stone in front of the barn. It would help if I would remember not to let her stay in the barnyard too. Been off for a good deal of the winter. I am not sure what is causing it but can not seem to get rested. Hoping the sun and the arrival of spring will make a huge difference. Also considering adding some Vit. D to my daily diet. Whisper is shedding in gobs and Bella is just plain shedding. Looking forward to summer and the chance of riding. The picture is from last week. Been out finishing the high fence on the east fence at the cabin for the last couple days. It is the solution for keeping the neighbors bull out. He took his cows off in late fall. I'm not entirely sure but there was a dead one left behind. Could have been he shot the bull? That bull was very aggressive. Either way if he puts cows back on for sure there will be a bull. We already have a *** heifer and lost a year's breeding on our Longhorn cow. Now that we put all the expense and effort into raising the fence odds are he will switch to goats? Fence is up and stretched with bracing. Still needs to be tied. Got home late and dirty rice is cooking. I am worried that we haven't heard from Stude? Everyone have a fine evening. Back from Nephew's wedding in Louisville, KY. Toured Churchill Downs. Paid extra for a behind the scenes tour that was well worth it. Went up to Millionaires Row, pretty cool and high up there. Would not want to go to the Kentucky Derby, Oaks, but another race would be fun and Louisville is worthy of a visit, nice city. Sent Stude an email. He thanked me for our concern. He said it has been a bit hectic this month. PHEW. Glad to know he is okay, just busy.